As always, the SFUPS Holiday Party was a great time that was shared with great friends and great food! Everyone enjoyed watching the Year in Review; a compilation of everyone’s accomplishments during the course of the year. Suzan shared the progress of the club over the past year. We have much to be proud of. Our meetings have focused on photographic tips and techniques, we offered several club dives, and our presence on the web is ever increasing. The highlight of the evening was the announcement of SFUPS Photographer of the Year. The competition for this prestigious award is always fierce, and this year was no exception. Igor entered his amazing photographs in both the Master’s and Challengers Categories throughout the year and consistently captured top honors. Igor was awarded a gorgeous metal print of his over/under shot of a pretty Water Lilly. He now enters the category of Master Photographers. Congratulations, Igor! We also honored several runner-up awards, as well as Master Photographer of the year. Second Place honors went to Zarina Staller. Debbie Wallace and Walt Sterns battled it out all year long and ended tied for the Third Place Award. 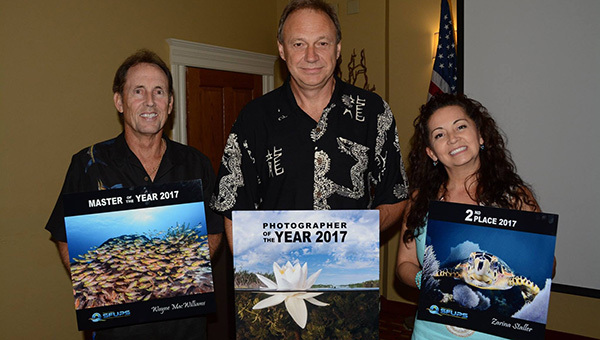 The Master Photographer of the Year was Wayne Mac Williams, while John Casey captured Videographer of the Year. Congratulations to all the honorees, and thank you to all our contestants for taking the time to enter your photographs! We were sorry to hear that we have two dedicated members stepping down from their years of service on the Board. 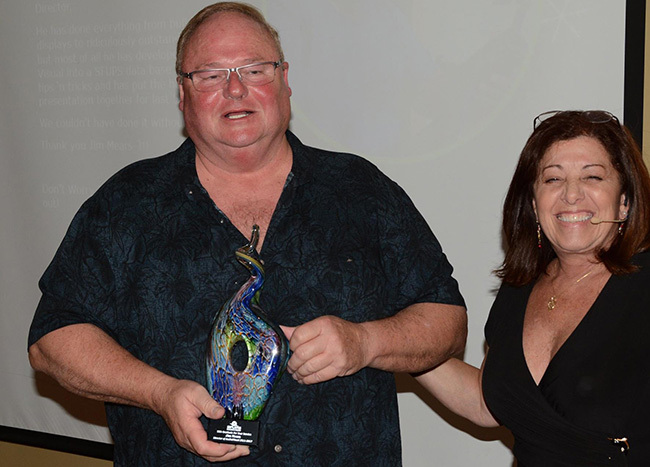 Jim Mears was thanked for his work and all the videography that he has done for the club. Suzan also thanked and acknowledged the work of Judy Townsend as Treasurer for the Club. 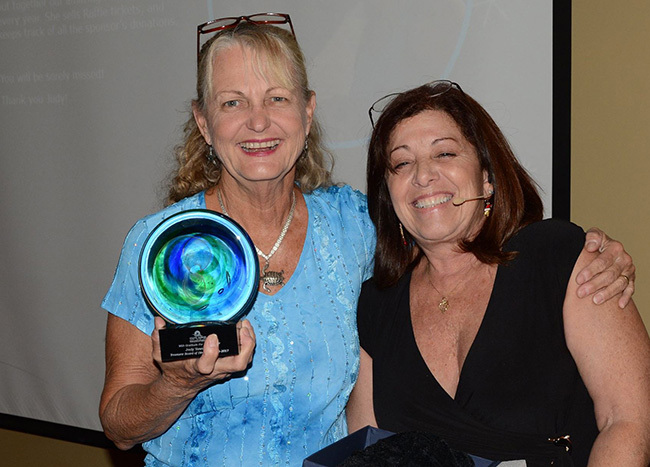 Both, received a beautiful commemorative award, and we hope they use all their extra time diving and taking beautiful photos! Joining the Board for 2018 will be Tom Poff who will handle Audio Visual/Video and Paul Stamatakis, who will assume the role of Treasurer. Suzan took time to recognize and thank our club sponsors. We are so fortunate to have many outstanding sponsors who treat us very well all year through their sponsorship, and by donating an excellent assortment of items for our raffles! Thank you to all our sponsors! Suzan also recognized the Board of Directors and thank all the people who volunteer to help at our special events such as Blue Wild, noting that we couldn’t be so successful without our volunteers. The evening drew to a close with our annual holiday raffle of amazing prizes donated by our sponsors. Thank you everyone, and we hope you are looking forward to another fantastic year of diving and photography!